In the beginning of the beer-making process, barley is milled and mashed to separate the starch from the fiber and protein. The starch goes into creating the beer itself and the fiber and protein turn into a leftover product called "spent" grain, which more often than not is thrown away. Some companies send their spent grain to feedlots, and others have created products like bread and dog treats. Now a new company is using this barley byproduct to create a line of healthy and sustainable plant-based protein beverages. Backed exclusively by Zx Ventures – the incubator and VC arm of the largest beverage company in the world, AB InBev – the startup Canvas is turning this spent grain into what they're calling Saved Grain. 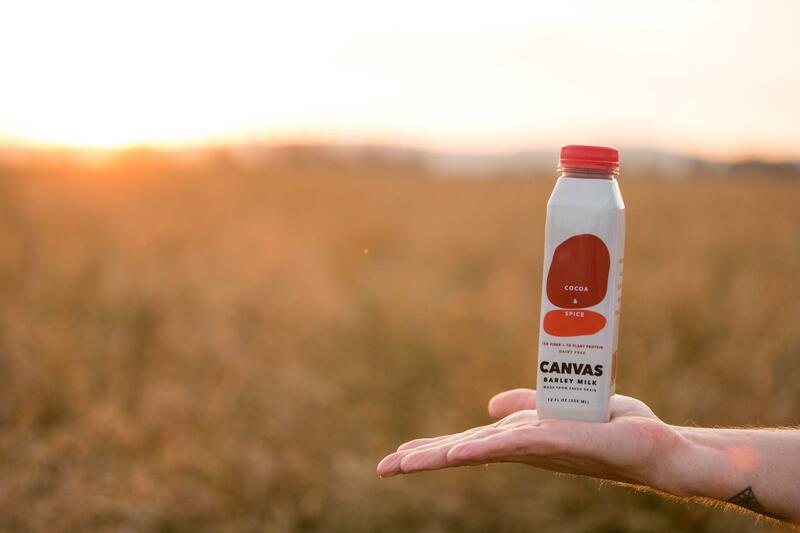 Using a proprietary fermentation process developed by AB, Canvas is refining the protein and fiber left from the barley grain to create a drink that co-founder and CEO Sarah Pool describes as “holistic, all-encompassing nourishment." The initial concept for a spent grain-based beverage was developed last summer at Zx Ventures’ incubator. After joining the company, Pool helped steer the challenging process of working with the perishable spent grain, experimenting with many formulations to find a palatable flavor profile – spent grain can be bitter and sour – without sacrificing nutritional content. The end result is their debut line of four flavors – matcha, turmeric chai, cold brew latte, and cocoa – which are rich in fiber, protein, medium-chain fatty acids and a dose of a do-good philosophy. As much as eight million pounds of spent grain are produced each year – about one pound per six pack. In their beverages, spent grain makes up about half of the liquid. Other ingredients include coconut milk, cashew milk, pea protein, chicory root extract, and natural flavors. For now, the company uses a production facility inside AB’s Newark, N.J. brewery that has been retrofitted to receive and process the spent grain for the beverage. But the technology and fermentation method can – and likely will – be integrated into more breweries in the future, further reducing costs associated with waste disposal. Canvas launched a Kickstarter campaign earlier this month and has already nearly doubled its $25,000 goal. Canvas plans to launch its first products sometime this fall.